De Maten in the Province of Limburg in Belgium is a nature reserve of about 5 sq. km (536.00 ha), and man-made cultural landscape. De Maten is a protected and listed landscape since 1975 and is located within the boundaries of the towns of Genk and Diepenbeek. Centuries ago over 35 fish ponds were created by damming the local burns, including the ‘Stiemersbeek’ and the ‘Heiweierbeek’. It is said that the name ‘maten’ relates to the English word ‘meadows’. Already in the early 16th century De Maten were used as water-meadows, which is a technique to increase hay productivity through irrigation of grasslands. Historically of interest is also that it appears that there been a watermill at De Maten, and also various World War Two remnants remain, including bunkers and anti-tank obstacles. In the late 1970’s there was much commotion around the protection of De Maten, as it was at risk of being more urbanised by the threat of a new expressway at the northern edge of De Maten. This road was intended as the new main connection between the cities of Genk and Hasselt. The city of Genk however opposed the road and did not give planning permission. De Maten falls under the Special Protection Areas (SPAs) which are designated by the European Community under the 1979 Birds Directive 2009/147/EC (SPA). Also the EU’s 1992 Habitats Directive 92/43/EEC (SCI) applies to De Maten. The Natura 2000 network consists of sites that are classified under the Birds Directive and Habitat Directive (the Nature Directives). Nature 2000 is described as the centrepiece of EU nature & biodiversity policy, with an aim ‘to assure the long-term survival of Europe’s most valuable and threatened species and habitats’ and ‘NATURA 2000 is the ecological network for the conservation of wild animals and plant species and natural habitats of Community importance within the Union’ (Source: Natura 2000). De Maten, with in the background the ‘terril’, a coal mining spoil heap, of the former mine of Winterslag. The top of the terril is at 163m altitude (Photo: Jan Haenraets, 2015). De Maten is a landscape of sandy bogs and bog woodland, with species rich grasslands, dry sand heaths and inland dunes. The EUNIS-Site factsheet of the European Environment Agency states that De Maten contributes to protecting fourteen habitat types of the Habitats Directive, and two species of the Nature Directives. These two species are the Water-Plantain – Luronium natans (L.) Raf., and the Large White-faced Darter, a small dragonfly – Leucorrhinia pectoralis (Charpentier, 1825). There are several trails that take you across the reserve, with a number of visitor car parks and entrance points. Trails are signposted and interpretation and maps is installed at the car park entrance points. Various parts of the park are fenced off for protective purposes. The trails around the site take you also through some of the neighbourhood’s streets, fields and a woodland. At the pond ‘Augustijnenweyer’ there is a bird hide overlooking the pond. More information and how to get to De Maten can be found on the website of the city of Genk. 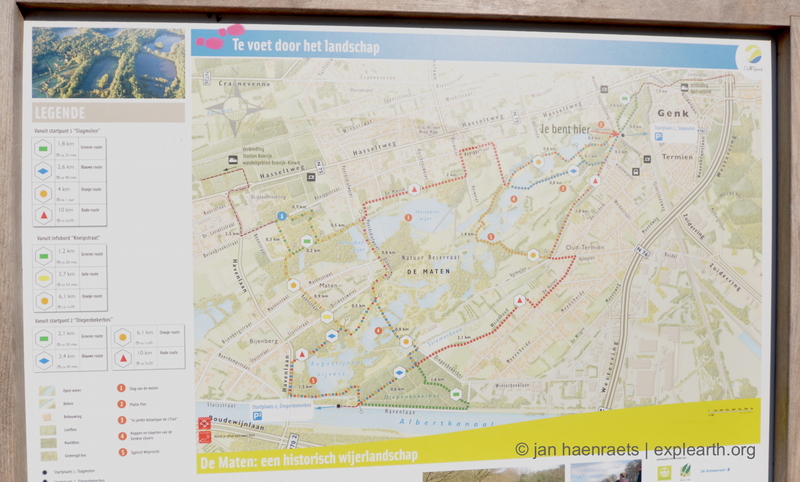 Trail map of De Maten. Click on the image to view the large scale version (Photo: Jan Haenraets, 2015). The Zen Garden & Why Use the Word Zen?